In honour of the festive season here’s a copy of the bulk email I sent to friends and family 13 years ago from Japan. 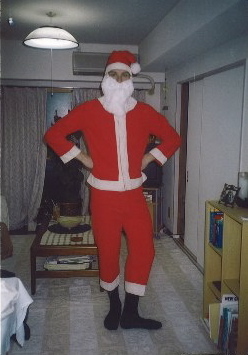 The photo is me in our apartment modelling the first Santa suit … Ho Ho Ho! A friend of ours on the parents and friends organisation at a nearby Kidergarten visited in late November with a request. Would I agree to dress up as Santa at their little Christmas break up party and hand presents to the kids? I agreed (how could I not?) but, in all honesty, I wasn’t keen. Not because I’m shy and retiring of course, but my level of Japanese is still awful and I was worried that I wouldn’t be able to communicate well in the role. Also the suit they’d brought along for me to try on was an old second hand thing, designed for a Japanese man of average height. It was, therefore, absurdly small on me. Part of me hoped that this would mean the gig was off but, two days before the “little party”, another suit (possibly flown in from the States) materialised. Unlike the original model, this one was new and super oversized so, if I threw in a jumper or two I could look positively “plump”. Our friend was in raptures about this and then proceed to explain the schedule. The plan was simple enough. I should have suspected something at this point. Schedules around here are rarely this simple and it is worth noting that our friend has a talent for understatement that the world of Real Estate would appreciate. So anyway, on the day I arrived at the venue and was then spirited away to the green room where my costume awaited me complete with a few extra bits and pieces. They had gone out and bought a few Reindeer bells, black gloves, a white wig, a pair of gold frame reading glasses (no lenses) and an utterly massive curly white beard. After putting on the gear I sat there for 20 minutes waiting for my cue. Have you guys seen “Gladiator” yet? You know the scene where the new guys wait to enter the ring and one fella has an accident? I can empathise! When my curtain call came I was lead to the back door of the darkened room. There was a lady M.C.ing (they have a real penchant for that sort of thing over here) from the stage at the front and when she had built up the suspense amongst the crowd I was given the nod and made my entrance. I shook my bells and yelled out “Merry Christmas” in what I hoped would be a deep voice that conveyed warmth, good will, and the spirit of the season. Instead, I sounded like a moron in a red suit like every other twit who tries to be Santa. I will never forget what happened next as long as I live. The lights came on and the masses turned around as one to look at me. THERE WERE OVER THREE HUNDRED PEOPLE IN THAT ROOM! The only thing “small” about it was the average height. About one hundred kindergarten kids and associated parents spun around and since every second parent had a digital camcorder to capture the moment, it was like waking up a multi-headed cyborg. I defy anyone to walk into a situation like that and look “jolly”. Fortunately, the entrance had been suitably impressive and the crowd erupted with cheers and applause which gave me enough time to regain my composure as I walked to the front of the stage. The organiser later complimented me on my bell ringing technique and thought I was being modest when I said that it was merely a natural reaction to the moment. I spotted three bags of presents (not hard – they were each about the size of a small car) and was making my way towards them when the MC called me over and I realised with a sinking heart that I was about to be interviewed. A couple of the youngsters from my apartment block thought they recognised their neighbour behind the bushy white beard and so, when the MC asked them if they had any questions for Santa, one of them asked where I came from. I replied in that deep moronic voice that I was from the North Pole. This seemed to settle it for my interrogator as he announced to the room his neighbour was from Australia and that’s south of Japan so I had to be the genuine article. In rapid succession I was next asked how did I get here, why did I come to their party, and what Japanese baseball team I supported. The crowd cheered and it looked like I had survived the worst. Here’s a tip: whenever it appears you have survived the worst, duck your head and run purposefully for the nearest exit. Don’t, under any circumstances, loiter. Again I made for the presents and again the MC intervened by handing me the mic and saying “Your song.” She also gave me a look that implied, ‘It’s in the schedule that you’re supposed to sing a song.’ I tried to give her a look that implied ‘No-one put that in my bloody schedule!’ but this was lost in translation through the beard and glasses. Next thing I know a lady is playing the opening bars of Jingle Bells on the piano and I’m singing in a forced and thoroughly unconvincing baritone (I think I was in tune though). Predicatably, I forgot half the words and so was forced to make some up as I went along. The cyborgs hadn’t missed a second of any of this so if these families ever show their home videos to bi-lingual friends I imagine they will wonder what the line “Jingle Bells, Batman smells, Robin flew away” has to do with Christmas. Finally, I was allowed to hand out the pressies which was actually a great deal of fun. All the kids were polite and thankful and extremely cute. My only problem was that with my @#$%#%* beard obstructing my view, I had difficulty seeing all the little ones around my feet and I had to walk very slowly and carefully to avoid stepping on them. After the presents had been distributed I could’ve just about left the party content except that parents holding the kinda kiddies’ younger brothers and sisters suddenly swamped me. It’s amazing how ruthless people can be in the pursuit of a Kodak moment. One particularly zealous dad thrust his 2-year-old daughter in my path with one arm and held out a video camera in the other. The poor kid had no idea what was going on. I patted her on the head and gave her my kindest, softest, most soothing “Merry Christmas hohoho” to which the girl jumped like she’d been electricuted. I couldn’t have scared that poor child any better if I was Stephen King. She howled and scrambled for the dubious safety of her dad who looked like I’d made his year by emotionally scaring his little girl for life. On the way home I did a quick self-assessment. Standard of Bell Ringing: Worthy of a one horse open sleigh. Quality of Singing: On par with an aging Frank Sinatra. Convincing level of Performance: better than a wine-swilling red costumed bum on the street corner … just. Rotundity of Girth: Not as good as John Candy but better than Jeff Goldblum. Overall Impact: Long lasting. In fact, if I’m any judge, there’s one little girl who’ll be in therapy for years. This entry was posted in Education, Family, Japan, Teaching and tagged #WPLongform, Christmas, humour, Japan, Kidergarten, Santa by sterlinghurley. Bookmark the permalink. Ha Ha ha! Perhaps, we can arrange a nostalgia performance at our X-mas break up? Why not? Now that classes are finished I haven’t traumatised a child for a week.